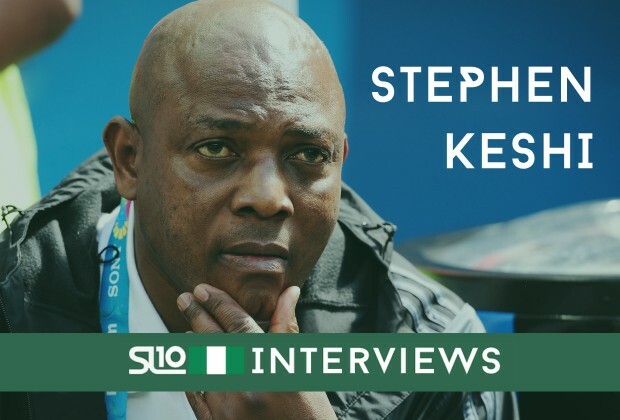 As his future continues to linger .Sl10 caught up with Nigeria coach Stephen Keshi. The former Super Eagles coach spoke about his future with Nigeria, the World Cup, contract offers from other countries and so much more. Enjoy. SL10: Coach, welcome from Brazil. You finally got the experience of coaching at the World Cup, kindly share the experience with us. KESHI: Well, it was a good experience that I cherish. It was a good experience for us all, the players, coaches and other staff of the team. It was a nice experience and we experienced the good, the bad, and the ugly. SL10: So talking about the good, what exactly were they and how do they make you feel? KESHI: I feel good about the good aspect of the World Cup. And what I mean is the potential in the team that I believe will come really good within the next couple of years. I think they will have a team that will make Nigerians proud and that is if they keep the current crop of players in place and make a very good environment for them. Like I said, I see lots of potential in the team and with the addition of some very good players as well, I believe Nigeria will have a very good team pretty soon. SL10: That game against France got a lot of people talking and given how it eventually ended, do you think Nigeria would have won it on another day? KESHI: Yes I think so, especially if the referee had allowed Emenike’s goal to stand. That goal would have lifted the spirits of the players and spurred them on. I thought that goal would have sealed the game but we also have to understand that a lot of the players are quite young and only just played at their first World Cup. And in such cases, you need leaders to push them forward and guide them. So yes, I believe Nigeria would have won that game on another day. SL10: Coach, you keep mentioning the word ‘them’, does this mean you’re truly leaving because it is being reported that the Nigeria Football Federation already offered you a two year contract? KESHI: No I haven’t spoken to anyone at the Federation, and I don’t know where such reports are emanating from. Nobody has offered me any contract, I haven’t spoken to anybody, so it’s just the way it is. I have no idea where all these are coming from because I’m even just hearing such for the first time. SL10: You visited the sports minister, what was the visit about and did you discuss? KESHI: Oh no, it was nothing, I just went to see him. He’s a friend, and he invited me over to his office so that’s why I went to see him, nothing more. So that’s it, it was just a visit. SL10: If given a contract offer now, would you be staying? KESHI: Well I couldn’t say, because a contract is supposed to be between two parties or more. So it’s not like I’ll just sign anything in the name of a contract if offered to me. It has to be suitable and mutually beneficial to both parties. If the offer comes, we will sit down and talk and if there’s something concrete, then we’ll see how it goes. SL10: So in that case, what exactly do you expect in a new contract offer? KESHI: Well for starters, my previous contract was never respected isn’t good. Whatever trips I took to visit my family in America, I always paid for which ran contrary to the contract agreement. I was paying one of my assistants (Valere Houandonou) for over a year, my former assistant Sylvanus Okpala was sacked without my consent and those things just never made sense. I mean Nigeria is my country and I love my country, but I’m out of contract now so I have to move on. I have spent over two years as coach of Nigeria, and Nigeria flows in my veins but I just have to move on. KESHI: No it’s not just South Africa. I have several offers but it’s South Africa that have been very vocal about their offer, so that’s the way it is. SL10: So if you get offers from these countries you’re talking about, and also an offer from Nigeria, would you give that special consideration to Nigeria? KESHI: Well if the Nigeria Football Federation and I agree, why not? There’s a project I’ve started in Nigeria that I would love to finish. So yes, that consideration will be given but if the offer isn’t good enough for me, then I will explore other options and possibly move on to another challenge. It’s always a good thing when you experience other climates. SL10: Speaking from the heart, do you still really want to continue with the Super Eagles project? KESHI: Well this isn’t about ‘heart’ anymore. I’ve given my heart to Nigeria, I have done it for the country for years. I played as a captain of the national team for 14years so this isn’t about heart anymore. It’s now about professionalism, I am a professional football coach and that is all I do. I have kids in the university that I have to feed and I can’t do that by ‘heart’. Doing the ‘heart’ thing cannot work anymore, because that isn’t going to put food on my table (laughs).